There are several situations where you will need to install a kitchen or bathroom loose backsplash. Not all countertops have this three and a half to four inch high wall protector attached to the top. Most granite and solid surface tops will not have the splashes attached. In some instances, Formica plastic laminate counters will not have a splash board attached either. Below is an excellent video reviewing the use of magnetic paint. It’s possible to use this paint on kitchen backsplashes. You have two options, you can use metal Formica or metallic paint. Formica can be used like a dry erase board. For the purpose of this instructional, a kitchen wall laminate installer cuts and fits separate boards around the cabinets. He then laminates them with metallic laminate by applying contact adhesive to both materials. The magnetic wall-splashes are then installed using Liquid Nails construction adhesive. I’ve been remodeling kitchens for many years. I can teach you the correct way to remove many different kinds of backsplashes. I think the most puzzling ones are the laminate splasbacks. There are certain ways to identify if they are screwed to the counter below or glued to the wall with caulk or liquid nail. This article will teach you how to make interestingly different kitchen backsplashes out of your own favorite photos. Between cabinets countertops and appliances, there’s not a lot of room in kitchen design to get super personal with your choices. A solution is to get creative with your backsplashes. 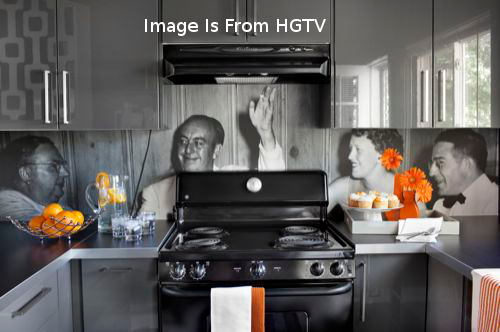 Click on this link(http://www.hgtv.com/design/rooms/kitchens/create-a-vinyl-photo-backsplash) and you you will find a video that demonstrates how to get super personal by adding photographs to your kitchen splash areas. This is the most unique custom design for a kitchen wall area backsplash I’ve ever seen. I rank it at the top of the list for creative ideas for wall splashes. 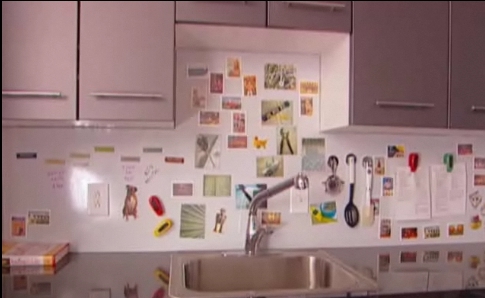 The video below introduces something different from the norm for kitchen countertop backsplash ideas. I am confident you will enjoy watching this unique method for building wall splashes. You can create a custom backsplash with depth and texture that will be the envy of all your neighbors, by pouring resin over common household objects.